The BSGs have bandwidths of up to 500 MHz and full bandwidth signal memory of up to 10 seconds. The bandwidth, memory depth and dynamic range make the BSG a powerful tool for broadband satellite communications, frequency agile radio communications, broadband wireless network communications, and radar test. 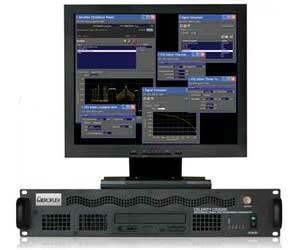 An open, software defined instrument architecture allows easy imports of user created waveforms. Vector Signal Simulator software (VSS) creates signal files for commercial wireless standards as well as generic nPSK, nQAM, nFSK, MSK, CW, tone combs, and notched noise signals. Any of these generic signal types can be gated or bursted in time, as well as hopped in frequency. Real signals, including recorded signals from Aeroflex Broadband Signal Analyzers or other recorder sources, can be imported and combined with digitally generated signals, and then played back on the BSG. Impairments can be added to the signals including thermal noise, phase noise, and passband amplitude and phase distortion. VSS provides the unique ability to mix any combination of signals and impairments to generate complex signal environments. Aeroflex Vector Signal Player software (VSP) provides simple controls for signal file selection, output frequency control and output power control. Aeroflex up converters use real (non-I/Q) conversion architectures, generating high dynamic range waveforms without the carrier leakage and signal image problems associated with I/Q modulators found in traditional signal sources.